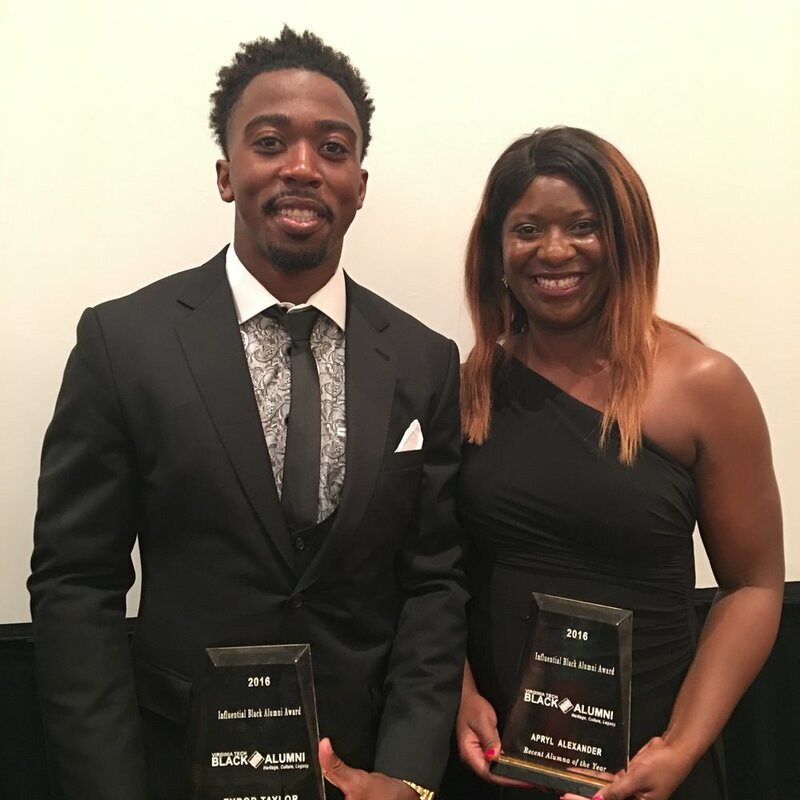 October 18, 2018 Apryl A.
Dr. Alexander received the Faculty Award at the Graduate School of Professional Psychology’s (GSPP) annual Redefining Mental Health: Celebration of Impact event (formerly the Philanthropy Gala). Each year an honoree is nominated and selected by the Graduate Student Association of Professional Psychology (GSAPP) and given to a faculty member who raises understanding and awareness for student scholarship and philanthropy at GSPP, as well as community advocacy and outreach. April 19, 2018 Apryl A. Such exciting news for the DU Prison Theatre Program! Dr. Alexander and Dr. Ashley Hamilton were a Community-Engaged Learning Mini-Grant from the Center for Community Engagement and Service Learning (CCESL) at DU to help support the program. Additionally, they were awarded a large Professional Research Opportunities for Faculty (PROF) grant which provided two years of support for the project entitled The DU Prison Theatre Project: Theatre as Rehabilitation; allowing for Dr. Hamilton to implement a theatre arts program at the Denver Reception and Diagnostic Center (DRDC) and Dr. Alexander will assist in program evaluation of the efficacy of the program. 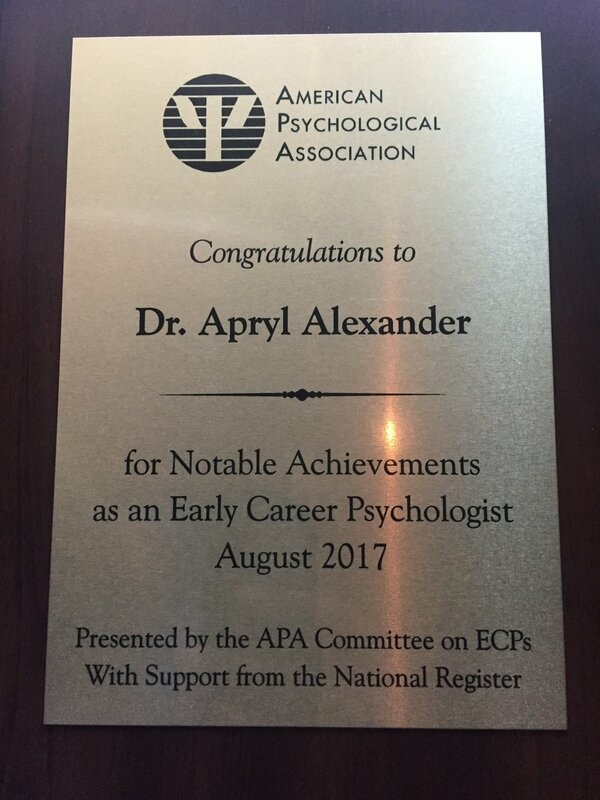 August 10, 2017 Apryl A.
Dr. Alexander attended the American Psychological Association’s Annual Convention in Washington, D.C. During the Convention, she received the APA Achievement Award for Early Career Psychologists from the APA Committee for Early Career Psychologists and National Register for Health Service Psychologists. This award is presented to individuals who have shown themselves to be rising stars, with great leadership under their belts and tremendous promise to change psychology for the better. 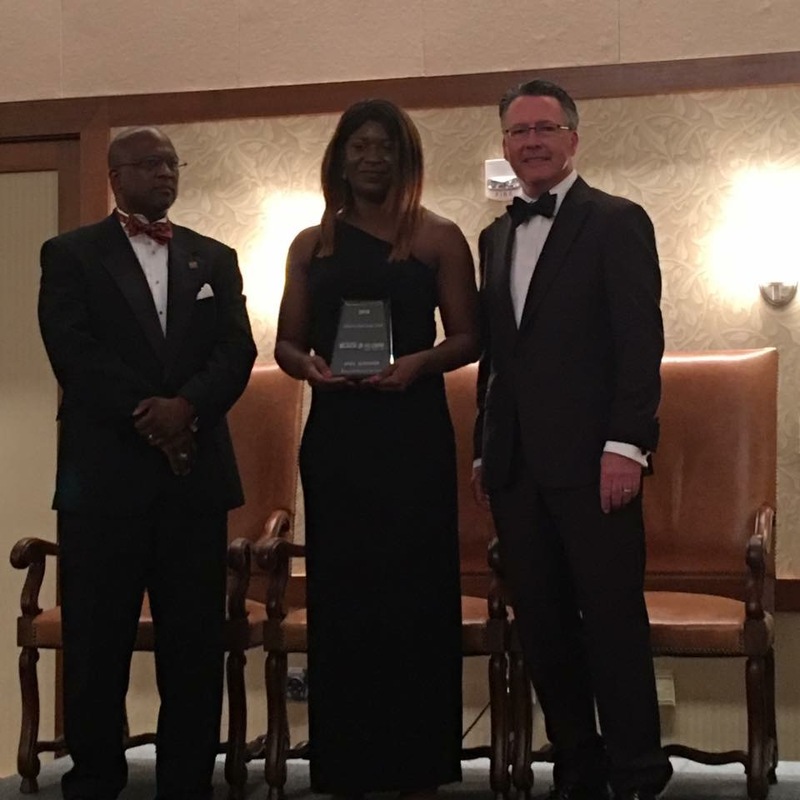 Dr. Alexander also received the Early Career Award for Outstanding Contributions to Research/Practice in the Field of Child Maltreatment from Division 37's (Child and Family Policy) Section on Child Maltreatment. May 27, 2016 Apryl A.
Dr. Alexander was inducted in the Business Professionals of America (BPA) Inaugural Alumni Walk of Fame. The Walk of Fame recognizes individuals who, through their performance and achievement, bring credit and honor to themselves and to BPA as a member and continued advocate. Dr. Alexander was active in BPA as a high school student, winning 1st Place in the Financial Analyst Team Delaware competition her junior year and sending her and her teammates to the national competition in Minneapolis. Her brother, Anthony A. Alexander (Assistant Vice President at Brown Brothers Harriman), continues to remain active in the alumni organization. 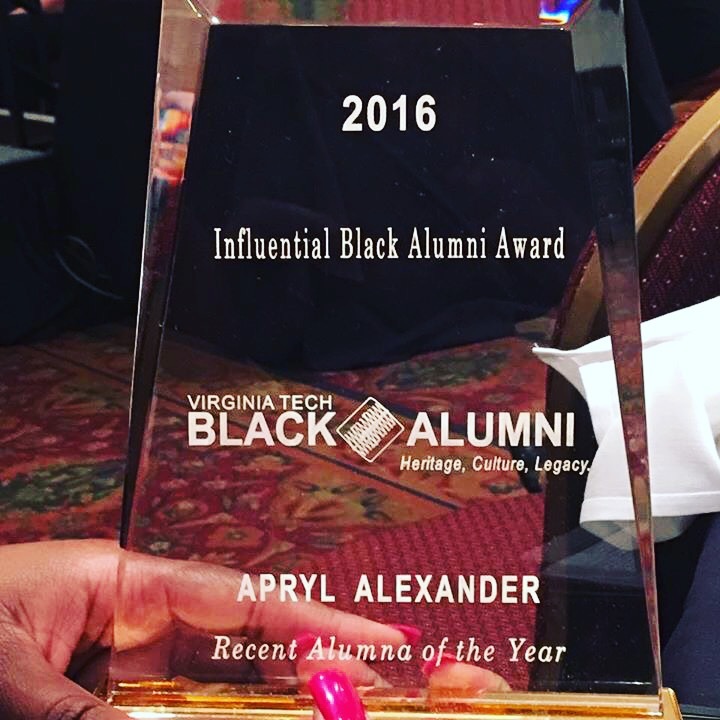 April 27, 2016 Apryl A.
Dr. Alexander received the 2016 Virginia Tech Influential Black Alumni Outstanding Recent Alumna Award from her alma mater. She had a fun filled weekend watching the Spring Game from the President's suite, tailgating, attending a black tie gala, and most importantly--reuniting with the Hokie Bird. While in the New River Valley area, Dr. Alexander was also invited by her mentor, Dr. Ann Elliott, to present a colloquium at her other alma mater, Radford University. Sponsored by the Department of Psychology and Center for Gender Studies, Dr. Alexander presented a talk entitled, Juvenile Injustice: How Psychology Can Inform Public Policy and the Law.